Our marketing blueprint was developed to build the customer footprint fast. Each service is described in more detail below. In a timeframe of about two weeks we can give you feedback about your product and the Dutch market opportunities. This service we call a market feasibility scan and is the start of our involvement. We will segment your potential target market. We will give you the ICT facts and figures of the Dutch business market segmented in ICT market clusters and divided by twelve vertical lines of business. We will make an estimated market potential of your product based on these clusters. We make a first analysis of your competition and the main players in the market. We will advise you about the most promising entry segments on the basis of all aspects of the local market situation. Finally we also highlight marketing remarks for your product/introduction strategy. The clusters and figures are based on research of the Dutch Ministery of Economic Affairs and International Data Corporation (IDC). Some slides of the scan. 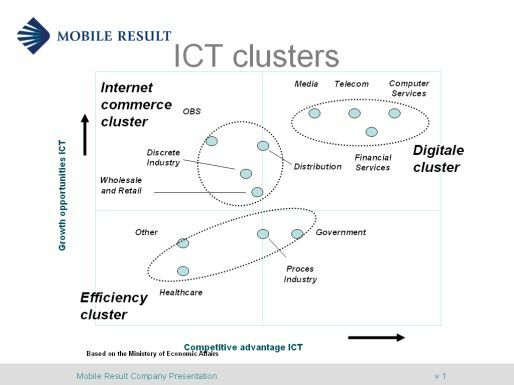 Comment: This clustering segments the ICT adoptation in the Dutch business market. It shows highly innovative clusters versus followers. Sales cycles are shorter or longer and this influences go to market strategies. Comment: We have breakdowns of ICT, mobile and wireless facts of every line of business. 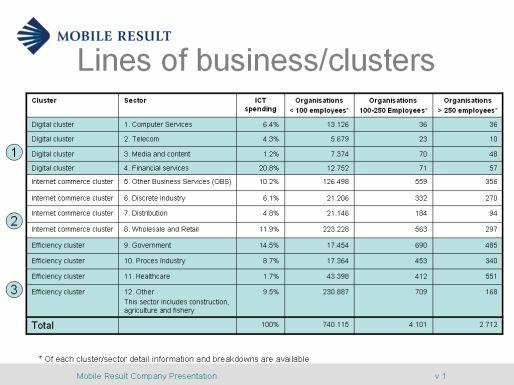 These breakdowns offer insights in ICT spending, market shares of operators, influencing attractivity of segments and potential partners to sell with. In two weeks you have feedback about the feasibility of your product and market information to finetune your product/market go to market strategy. Based on a plan of approach we can develop a go to market plan for your organization. 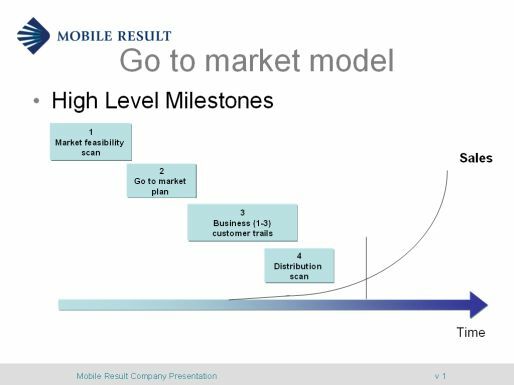 Based on the sales objectives, this go to market plan will cover the market situation in depth, the go to market options and our advice, and the actions required to start up the sales fast. Our go to market plan is based on the Chasm group (Cross the chasm, Inside the Tornado), figures from the Ministery of Economic Affairs and International Data Corporation. Its also in alignment with Government Innovation Grants (Senter). With this plan there is a good basis for a realistic business plan. In this period we as mobile result can act as your local marketing office. We can develop a program to implement your product or service with 1-3 business trial customers and build the actual first reference cases. This program is based on the outlines of the go to market plan. Based on the entry segment we will propose a shortlist of clients. We will target these clients, present your product and realize customer trials. Customer satisfaction about your product is an essential part for a successful footprint to conquer the Dutch market. A satisfied client make the next sales much easier and will be the first step to position your brand in the Dutch business market. As a result of this approach you are able to have fast direct contact with customers in the Netherlands. We can work as your local project manager with these customers and do the main contacts with partners like system integrators if required. We have developed an marketing approach to select the right distributors and agents for the introduction phase or to support you in your local office. We will highlight the opportunities of local Dutch distribution alternatives like value added resellers, system integrators or direct sales in the Dutch market. Based on your product distribution criteria we will offer you a distribution long list. On the basis of selection criteria like service, pre-sales, after sales, coverage, knowledge, competitive stance etc we can propose a shortlist. With this shortlist you have the right distributors who can introduce the product to the market. We can introduce the initial discussions with distributors and get their feedback. In this period we as mobile result can act as your temporary representative. We have divided the distribution market in four area's: the telecom distribution channel, the IT distribution channel, the wireless internet providers (WISP) and the mobile operators. We can introduce you to a partner which is specialized in the rollout of your own local office. This prepaid service is specific for clients for advice, business development support, marketing support, product management support, market support or knowledge transfer. We can offer them 8, 24 or 40 hours of marketing support as a prepaid service and the client can use these hours (minimum 1 hour per contact).